B and I usually have more time to devote to cooking on Sundays, so we often try to do something a little more ambitious. I’m going to try to start sharing some of our favorite Sunday dinner recipes on a more regular basis. After our meal at the Inn at Little Washington, we were inspired to try some of the recipes from Patrick O’Connell’s cookbook, Refined American Cuisine. Since tomatoes are at their peak right now, this recipe is perfect for this time of year. The gazpacho and salsa are a great combination on their own and this recipe makes enough that you’ll have some leftovers, though I highly recommend drizzling a little bit of some good olive oil on top when you re-serve. In a blender or food processor, puree the tomato, cucumber, bell pepper, jalapeno, onion, celery, and garlic in batches until smooth. Strain (we did this because we wanted to be fancy, but it’s really not necessary if you don’t have loads of time or a food mill). Add the olive oil, Tabasco, lemon juice, vinegar, sugar, cumin, and celery salt. Mix well and refrigerate. When the puree is thoroughly chilled, season to taste with salt and pepper. Store in the refrigerator until ready to serve and allow to come up to room temperature before serving. Note: Makes about five cups. You will need approximately 1 cup for this recipe. Serve the remainder as a soup the following day. **There’s a lot of mincing in this recipe. You can save a lot of time by chopping these ingredients in the food processor. Also, we had a lot of veggies and ended up quadrupling the recipe, which you’re welcome to do. In a small mixing bowl, combine the tomato, cucumber, bell peppers, jalapeno, red onion, and shallot. Stir in the the parsley, tarragon, celery salt, extra virgin olive oil, and sherry vinegar. Season with salt and pepper to taste. 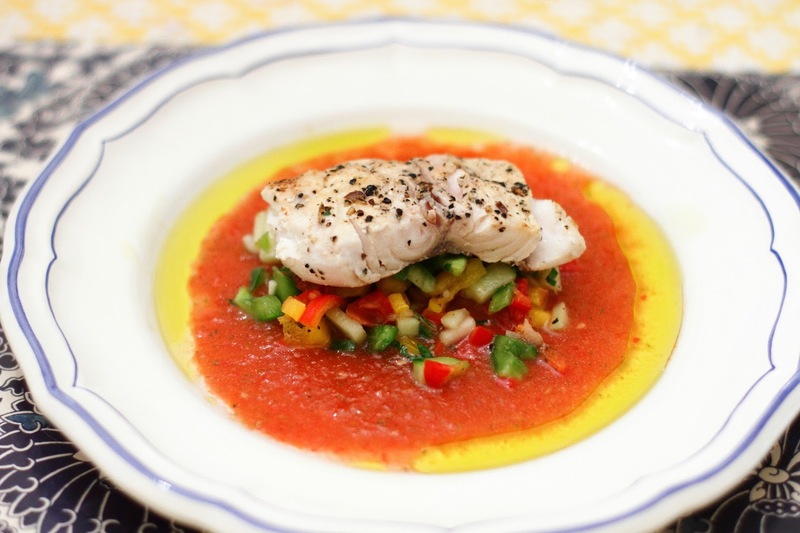 **The original recipe calls for red mullet fillets, which can be hard to find in the states, but you can substitute any delicate white fish like sole, flounder, or striped bass. In a nonstick skillet, heat the oil over high heat. Season the fish on both sides with salt and pepper. Cook the fish, skin side down, for about 2 minutes, until the edges are crisp and golden. Flip the fillets and finish cooking them on the other side for about 30 seconds. Keep warm. To put it all together, pour 2 tablespoons of the gazpacho sauce into each serving bowl. Drizzle a small amount of extra virgin olive oil around the sauce. Place 1 tablespoon of gazpacho salsa on in the center of each bowl. Place a hot piece of the fillet on top of the salsa and you’re done!